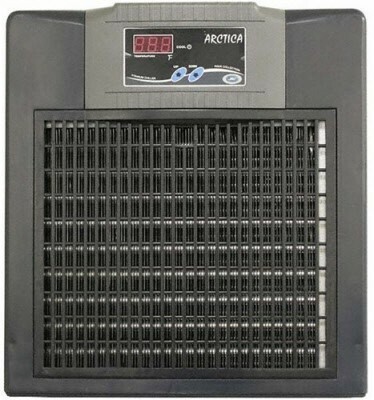 1/3 HP Inline Chiller DBM-250 Recommended for Aquariums up to 340 Gallons. 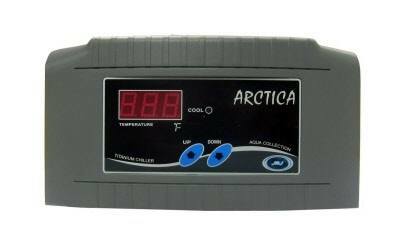 Features built-in temperature controller with digital display, titanium heat exchanger, black ABS cover, and a 2-year warranty. Unit produces some of the lowest noise and vibration levels of any chiller on the market. Recommended Flow Rate: 480 gph. Input/Output: 1/2", 5/8", 3/4" INS (Hose Barb). 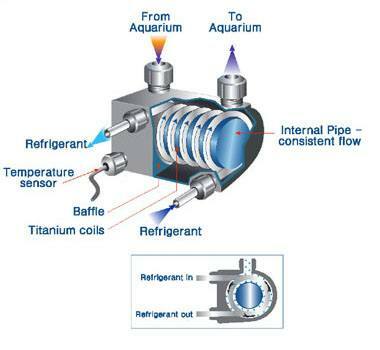 Using either an existing pump or an additional pump, water is circulated through the chiller, cooled, and returned to the aquarium or filter system. All models are safe for use in either salt or fresh water. Free Ground Shipping in the contiguous USA. FREE GROUND SHIPPING!!! LOWEST NOISE; VIBRATION LEVEL. FULL AUTO DIGITAL TEMPERATURE CONTROL SYSTEM. NO HARD PLUMBING NECESSARY. CONDENSER GRILL LOCATED IN FRONT FOR REGULAR MAINTENANCE. NEW-REVERSE AIRFLOW TECHNOLOGY. SMALL FOOTPRINT. ENERGY EFFICIENT 250 WATTS. "EASY LIFT" SIDE HANDLES. CE APPROVED. 2 YEAR WARRANTY.4000BTU/hr; 4.84AMPS; FLOW RATE MINIMUM 480 GPH; WEIGHT 54LBS, DIMENSIONS (W X D X H) 13.8"X15.7"X14.8"; INLET/OUTLET 1/2", 5/8", 3/4".